The first time I ever tried chipotle aioli was at my favorite beer joint in Astoria, Queens called Sunswick. I would always ask for a side of it when I ordered their chicken tenders. I liked dipping the crispy tender into the smoky goodness before each bite. 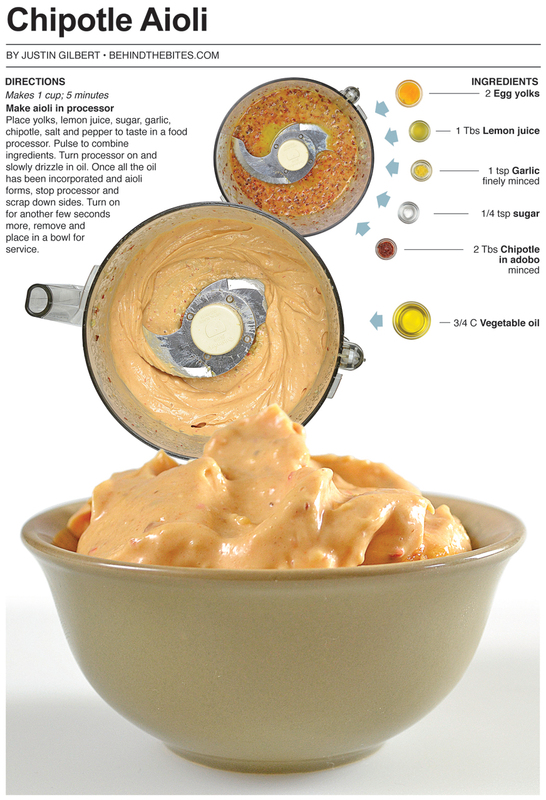 For years I made a homemade version by mixing minced chipotle pepper with mayonnaise. It was always tasty but it was never as good as what I had eaten at the Sunswick. Recently I had a couple of chipotle peppers left over from another recipe – which is typical. I always seem to have a third of the can or more leftover every time I use them and they usually end up getting thrown away after a month in the fridge. Instead of letting the chipotle peppers go to waste I made it a point to use them. 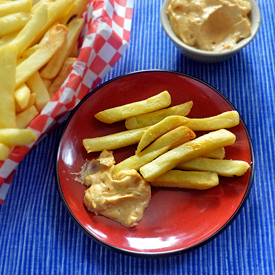 I decided it was time to make a chipotle aioli from scratch, not the easy chipotle mayo version I’d been making for years. I made regular garlic aioli sometime ago that was inspired by a version from Cook’s Illustrated, it was ok, but after making it, I thought the olive oil the recipe called for wasn’t the right choice. I decided I would throw out any health conscious whims and use vegetable oil for the this aioli along with a few other modifications including the addition of two tablespoons of miced chipotle peppers. 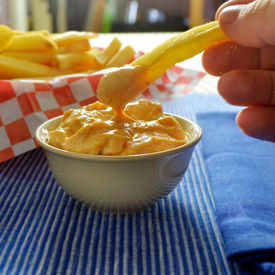 When it was all said and done, I really loved the flavor of this aioli, it took me back to the tasty chipotle aioli I enjoyed at the Sunswick. 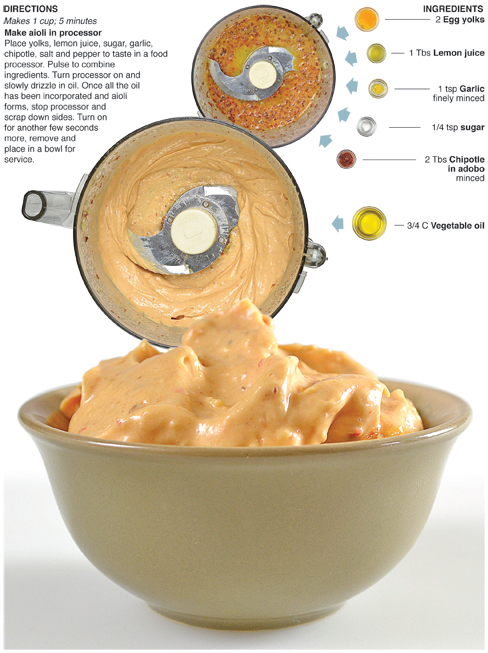 I realized the Sunswick was making it from scratch, which is why my previous attempts of chipotle mayo were never quit as tasty as the aioli. If you have a few chipotles left in the bottom of a can I highly recommend trying this for a spread, or do what I did with this batch - use it as a dipping sauce for fries. It’s hard to believe that it has been over three years since I moved from New York City and enjoyed the chipotle aioli at the Sunswick. There are times when I really miss New York but I have to admit leaving was the best choice I have ever made. I've grown creatively, spiritually and best of all – reconnected with my family. There may be a point in my life where I decide to reside in the Big Apple once again because I will always have a soft spot for it. I didn’t leave because of New York itself, I left to explore the place I grew up and to try and reinvent myself professionally. I feel like I have (with a long way to go yet) and I’m more inspired than ever to keep creating, it’s gotten me this far and I can’t wait to see where it will take me in the future. Place yolks, lemon juice, sugar, garlic, chipotle, salt and pepper to taste in a food processor. Pulse to combine ingredients. Turn processor on and slowly drizzle in oil. 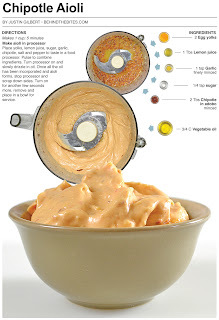 Once all the oil has been incorporated and aioli forms, stop processor and scrap down sides. Turn on for another few seconds more, remove and place in a bowl for service.